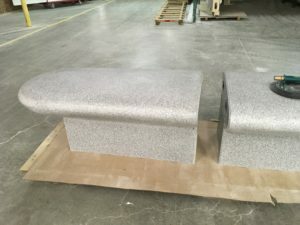 Architects, Designers and General Contractors need solid surface subcontractor resources that are willing to develop the finer technical details of a project. Time spent “upfront” by a qualified subcontractor addressing these issues can contribute to the overall success of a project. Construction schedules today have become tighter in our innovation and technology focused world. Design Professionals are challenged to find the time necessary to develop project design details. Communication slowdowns from Architect RFIs contribute to schedule delays resulting in headaches for the General Contractor. Focused on the “bigger picture” of running a project, General Contractors are then squeezed to find solutions to keep their projects moving. ASST is proactive in our approach to providing the necessary design assistance and addressing the details of fabricating. 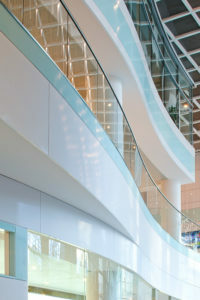 ASST was asked to assist with the development of a large clear resin panel media wall for the Chevy Chase Pavilion. 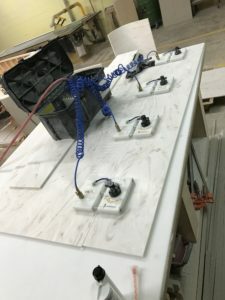 Working closely with Bethesda–based architect Streetsense, ASST arrived at a design solution for a custom bracket and aluminum joint system to connect the resin panels across the face of a media wall. A mock-up was created for the Owner with the LED lighting modules to test the distance required from the face of the resin. This was a critical dimension. Too close or too far and the projected images would be distorted. The Chevy Chase Pavilion project was an amazing success and an example of the kind of collaborative design assistance we perform here at ASST. It is our mission to ASsiST! In times of difficulty, like a recession, innovative thinkers are the ones who thrive – regardless of industry. In the case of retail, brands that are succeeding are putting their best foot forward by investing in innovative spaces that architecturally and aesthetically communicate the main principles of the product or service. As a result, concept stores are breaking out and becoming a trend. 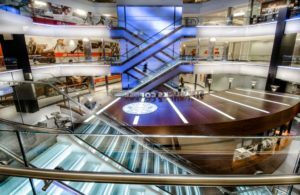 Contagious Magazine reported that concept stores are succeeding because they provide consumers with a stimulating experience on multiple levels. High-end brands have known for years that the atmosphere of a retail space is almost as important as the product. As a result, companies have invested large sums of money into creating unique spaces to attract and keep the attention of consumers. Brands are focusing their attention on making radical and attractive spaces with the use of explosive architectural vision, reported HongKiat.com, a design blog. Nothing proves the existence of a product, service or brand like the physical embodiment of that entity. For example, the Chevy Chase Mall Pavilion in Maryland has recently been completed by ASST. Working closely with the design firm streetsense and general contractor, Hitt Contracting, ASST assisted with the design, fabrication and installation of a 3Form translucent media wall, escalators, stair wells, walnut wood casework, upholstered seating and a new prime location for Starbucks Coffee in the middle of the action. ASST is proud to have been awarded a Washington Building Congress Award for Excellence in Craftsmanship on this challenging project. Be sure to visit ASST's new website www.asst.com to view more images of this innovative project and to learn more about the product solutions and fabrication services ASST offers.